Whittier Christian 52, Village Christian 44 — Shane Dean scored 15 points and Christian Labadie added 12 points for the Heralds in an Olympic League victory. Village Christian 41, Whittier Christian 27 — Kacie Hunt scored 15 points and Christa Evans had seven rebounds for the Heralds in an Olympic League loss. WHITTIER — Whenever California and La Serna high schools meet, you can almost always throw out their records, in any sport. Friday night was no exception in boys basketball as the Condors came out flying with a quick start, but host La Serna proved to be too much in the end. The Lancers came away with a 56-46 victory before a packed house at Melvin E. Locke Gymnasium. La Serna (16-7, 5-1), which entered the game tied with Whittier for first place in the Del Rio League, and Cal (4-19, 0-6) played a typical rivalry game with both fan bases at their best. Leading the way for La Serna was junior guard Walter Franco with 15 points (seven in the third), followed by Cedric Sobers (14) and Garcia with 13. La Serna built a 22-12 lead late in the second quarter, ending the half on a 7-3 run. Abel Ramirez, who scored seven points in the third quarter, including a 3-pointer, saw his team fall 16 points behind the Lancers (42-26) heading into the final quarter. SANTA FE SPRINGS — St. Paul High School was one game short of a Santa Fe League boys soccer title last season. The Swordsmen’s goal this season has been to make up the gap, and they continued in that quest Friday. Michael Lara had a goal and two assists and Alexander Corpus scored two goals and host St. Paul stayed in first place with a 3-0 victory over St. Pius-St. Matthias Academy. The Swordsmen improved to 13-5 overall and 6-0 in league play. They are ranked No. 6 in CIF Southern Section Division 7. The Warriors slipped to 3-5-2 and 1-3-1. 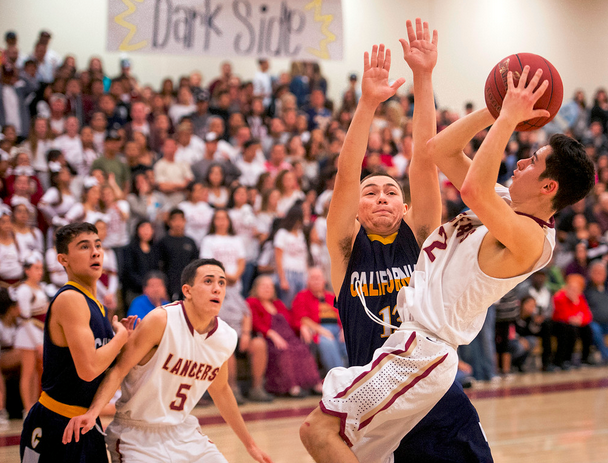 The Swordsmen played that way Friday, and got off to a quick start. Lara got loose down the center and scored from inside the penalty area in the fifth minute for a 1-0 lead. He added to the advantage in the 38th and 40th minutes. Lara again got free and made a perfect cross pass to a hard-charging Corpus, who tapped it in the open net for a 2-0 lead with just over two minutes left in the first half. The two combined again two minutes later. Lara got open down the right side and Corpus converted Lara’s cross pass with a shot for a 3-0 lead with about 20 seconds left in the half. St. Paul was dominant for much of the game, outshooting St. Pius-St. Matthias, 12-1 in the first half and 16-4 for the game. The win was the Swordsmen’s eighth consecutive victory and their ninth during their past 11 games. They stayed at least one game ahead of St. Anthony, who beat St. Paul for the title last season. The Swordsmen scored a 2-0 win over the Saints two weeks ago. 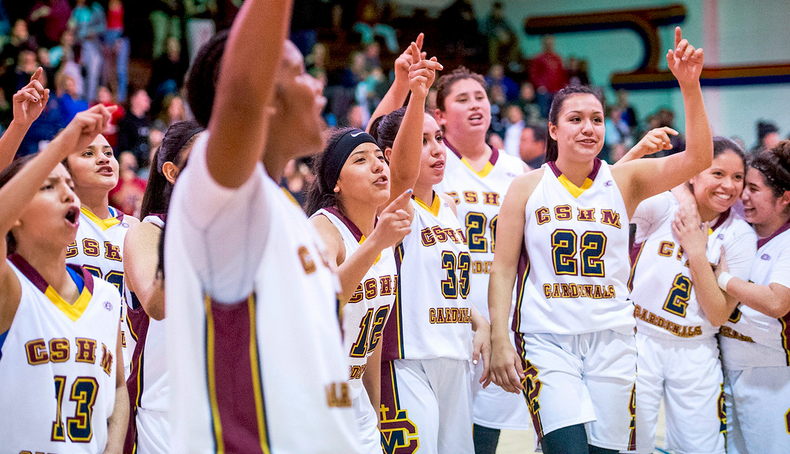 MONTEBELLO — Cantwell Sacred Heart of Mary knew it had one chance to earn at least a share of the Camino Real League girls basketball title. The Cardinals made sure they didn’t waste the opportunity on Thursday. Lily Perkins scored 20 points and had two key baskets during the final 30 seconds as host Cantwell rallied for a 47-44 victory over St. Monica to move into a first-place tie with the Mariners. Kathy Pinnock had nine points, including two crucial 3-pointers in the final two minutes, for the Cardinals, who improved to 18-6 overall and 4-1 in league play. Molly Tomlin had 12 points for the Mariners, who slipped to 15-6 and 4-1. St. Monica scored a 47-42 victory over Cantwell earlier in the season. Both teams have three league games left. It looked bleak twice in the second half for the Cardinals. The Mariners, after outscoring Cantwell 18-6 in the second quarter, held leads of 10 points in the third quarter and eight in the fourth. But each time the Cardinals rallied. They cut St. Monica’s lead to 41-37 with 2:24 left following a 3-pointer by Valeria Lizarraga and two free throws by Perkins. St. Monica got the lead right back following a 10-foot turnaround by Gloria Scipioni with 50 seconds remaining. Cantwell followed with a turnover, but Tomlin was short on a 9-footer in the lane with 28 seconds left. Perkins then followed with a layup and a 44-43 Cantwell lead with 15 seconds left. Brianna George missed an inside shot with 10 seconds left before Perkins followed with a layup to clinch it at 47-44 with two seconds left. 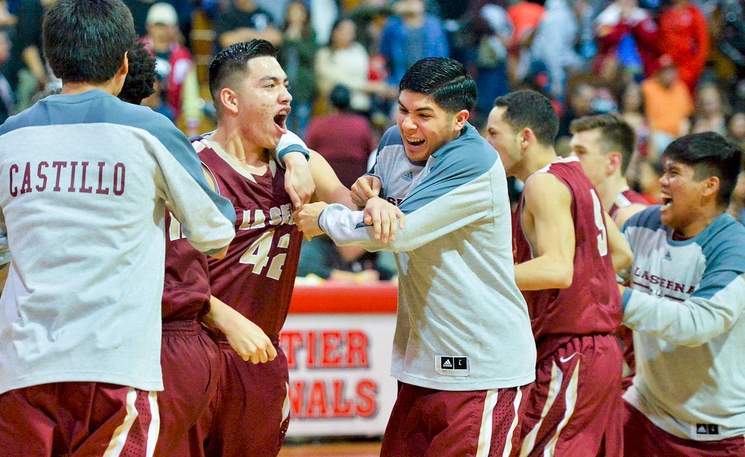 WHITTIER — There will be a title chase during the second half of the Del Rio League boys basketball season after all. La Serna made sure of it Wednesday. Jessie Garcia scored 23 points and made two free throws with 2.2 seconds left as the Lancers tied host Whittier for first place after rallying for a 44-43 victory over the Cardinals. Cedric Sobers also had 10 points for La Serna, which improved to 15-7 and 4-1. Miguel Salazar and Anthony Rios had 12 points each for Whittier, which slipped to 15-7 and 4-1. The Cardinals had a chance to win it, but Salazar’s desperation heave from half court fell short at the buzzer. La Serna, which trailed by 12 points late in the third quarter, rallied to trail, 39-34 after three quarters before coming back from a five-point deficits in the final two minutes. Garcia started the rally with a 3-pointer to cut Whittier’s lead to 43-41 with 1:08 remaining. Devon Glover then had a steal before making 1 of 2 free throws to get it to 43-42 with 52 seconds left. Salazar, who had just three points in the second half, missed a 3-pointer with 24 seconds left. Garcia then drove the lane and threw up a 10-foot floater that was long. But he was fouled Rios with two seconds left. He calmly made both for the win.